Netwrix Auditor for NetApp provides complete visibility into everything going on in your NetApp storage system. The application delivers deep insight into sensitive data; changes to files, folders, shares and permissions; effective permissions; successful and failed access events; and data usage and data ownership. Delivers information about sensitive data stored on your NetApp filers, including clustered Data ONTAP, such as its location, data ownership and data access rights, and all activity around it. 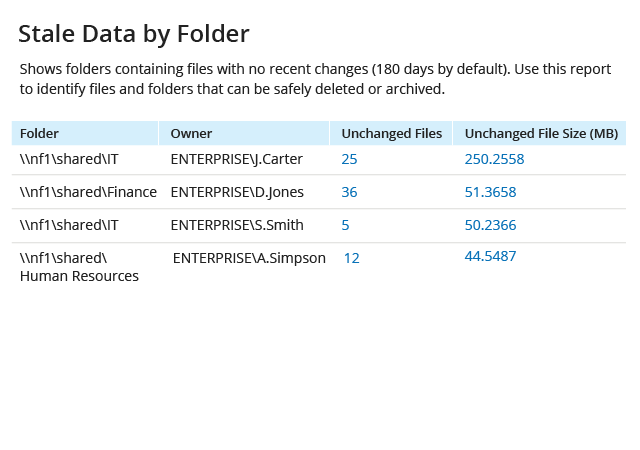 Enables NetApp file auditing without the noise associated with native audit event logs, and delivers human-readable information on who changed what, and when and where each change was made in your NetApp filers. Reports on both successful and failed file and folder access events, with details such as who was trying to read what file and folder, and where and when the access event took place. Reports on effective user permissions and enables you to see if there are any deviations from your permissions baseline by comparing the current state of NetApp filer permissions to any past state. Notifies you about suspicious or unauthorized actions, such as a sudden spike in file deletions, which could be a sign of malicious insider activity or a ransomware attack in progress. Provides actionable details on data ownership, data usage and data volume; and identifies stale and duplicate files, including their size, so you can keep storage use under control. Includes predefined reports mapped to specific compliance standards, including PCI DSS, HIPAA, SOX, GLBA, FISMA/NIST, CJIS, GDPR and more. Makes it easy to dig deeper into the root cause of an issue and investigate suspicious activity. Simply adjust your search criteria to find exactly the audit events you need. Helps improve data security by identifying security gaps, such as inappropriately configured data access rights, overexposed data, and potentially harmful files on your NetApp filers. Improves detection of malicious actors in your environment by delivering an aggregated trail of anomalous user activity with the associated risk scores, so you can prioritize your investigation efforts. Provides security intelligence about suspicious file access events, including access to archive data, and reports on excessive access rights, so you can mitigate the risk of a data breach. 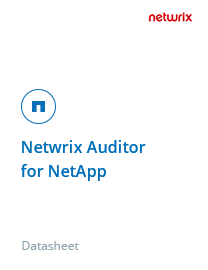 Netwrix Auditor enables NetApp auditing by providing capabilities for NetApp CIFS audit, including monitoring of changes and data access, and the discovery and classification of sensitive data on NetApp filers. It supports all the latest versions of the clustered Data ONTAP operating system. With more visibility into what’s going on in your NetApp filer storage, you can pass compliance audits with less time and effort, address auditors’ questions faster, and solidify data security across your organization. Stay abreast of illicit data and permissions changes that undermine your security policy and can lead to data breaches. Use pre-built alerts or set up custom alerts on any events audited by Netwrix Auditor for NetApp that you want to be aware of. 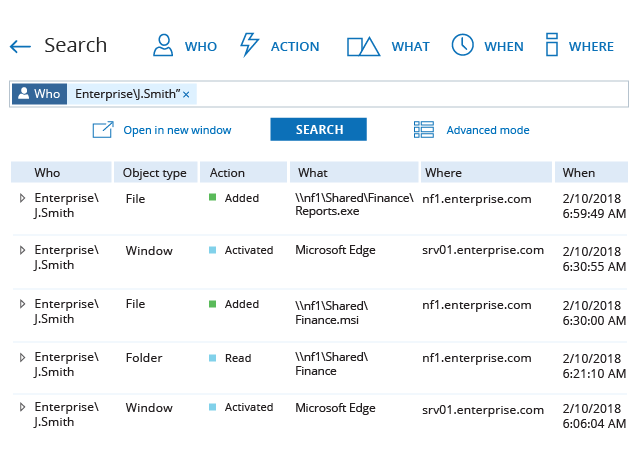 Instead of painstakingly sifting through native audit logs, use Netwrix Auditor’s flexible search engine to quickly narrow down your search to the particular NetApp Data ONTAP events you are looking for. For example, you can focus on a particular admin who has just changed access rights to the accounting folder and easily view what else they have been up to in your environment. Use data discovery and classification functionality to demonstrate that the regulated data is stored only in secure dedicated locations, access rights to that data are assigned properly and you closely monitor activity around the data. The two-tiered (file-based + SQL database) data storage ensures you can keep your audit records for as long as the regulation requires. To improve user productivity and reduce costs, Netwrix Auditor for NetApp facilitates cleanup of NetApp filers. It identifies and reports on empty folders and duplicate and unused files, including the path to these files and folders, so you can back up or move a file directory you no longer need to optimize storage use. Discover how Netwrix Auditor for NetApp can help you improve data security, prove compliance and enhance data governance across your NetApp filer appliances. 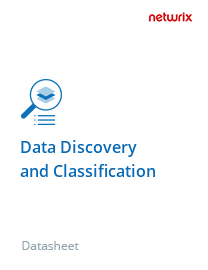 Check out how Netwrix Auditor – Data Discovery and Classification Edition empowers you to locate critical data and secure it in accordance with its value or sensitivity. Fresno City College ensures data confidentiality and holds employees accountable for unauthorized data deletions. FXCM tightens control over user actions that could potentially compromise sensitive data and ensures compliance. Rockford Toolcraft secures customer data and slashes the time required for investigation of issues from hours to minutes. "I love Netwrix Auditor for the complete visibility it provides for file servers. It helped me identify and recover files affected by malware. The software also comes in handy when employees accidentally move or delete other users' files. Combined with NTFS permissions, files are safer and more reliable. When preparing for and passing internal audits, the software saves us a great amount of time." Director of IT, Miller & Milone, P.C. Any change to file or folder permissions or any unauthorized access can put your sensitive data at risk. To keep suspicious activity from going under your radar, you need pervasive visibility into what’s going on across your NetApp filers, so you can spot and choke off threats before it’s too late. Netwrix Auditor for NetApp enables efficient NetApp CIFS auditing and delivers insights on changes and data access events on NetApp filers. With this solution at hand, you get all the important details: who performed each action, when and where it happened, and the before and after values for each change. And Netwrix Auditor for NetApp supports all the latest versions of clustered Data ONTAP. With ransomware becoming ever more sophisticated and widespread, from Cryptolocker a few years ago to the more recent Wannacry and Petya malware variants, having a comprehensive ransomware protection strategy has never been more important. Netwrix Auditor for NetApp can help you maximize your efforts in mitigating the ransomware risk by providing audit intelligence about configuration and user activity in your NetApp filers, including those running NetApp Data ONTAP. Netwrix Auditor empowers you with the information you need to reduce your attack surface, identify signs of an attack in progress and slash the time needed to restore encrypted data. Are you looking for ways to harden the security of your critical information? Netwrix Auditor’s detailed, comprehensive reports will help you stay up-to-date on activity across your NetApp filers and quickly detect and investigate suspicious behavior that can threaten the security of your critical assets. By collecting and consolidating all NetApp logs, Netwrix Auditor makes sure no action goes unnoticed. Moreover, it delivers all the necessary information on failed data access attempts, unauthorized permission changes and more in easy-to-read reports, so you can investigate and remediate issues before any damage is done. Shares on file storages, including NetApp filers, are one of the top vulnerabilities in your IT infrastructure. If employees gain access to the sensitive data stored there without a valid business need, your organization is at risk of data tampering or exfiltration. 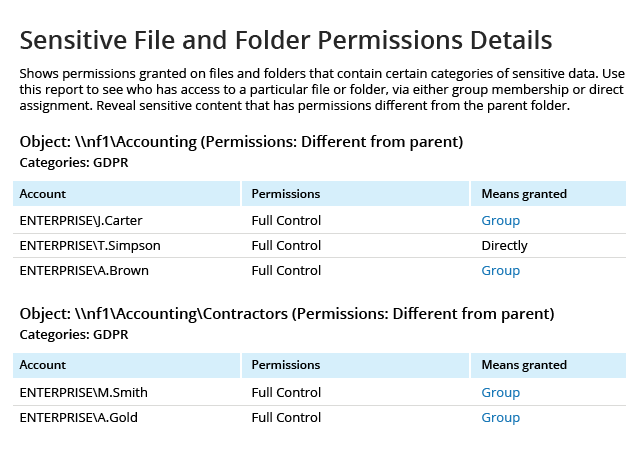 Therefore, you need to keep a close eye on NetApp CIFS share permissions and user activity, including who has access to each share, how that access is used and what changes are made to those permissions. 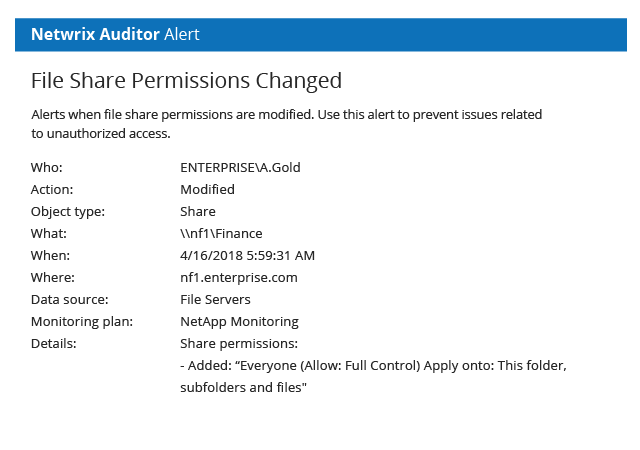 Netwrix Auditor for NetApp delivers complete visibility into all activity on NetApp filers, including effective permissions, access to shared folders, changes to permissions and more.